Free Pattern Turquoise Pullover Pattern From "Braids"
You will need: yarn (100% wool; 120 m / 50 g) - 600 (650) g ​​turquoise; Knitting needles № 4,5 and 6; circular needles number 4,5. Eraser A. Knitting in rows in the forward and reverse directions: the number of loops is a multiple of 4. Facial rows: * 1 d., 2 persons., 1 w., From * repeat. Purl rows: knit loops on the picture. Knitting in a circle: the number of loops is a multiple of 4 + 2 n. Knit alternately 2 w., 2 persons., Finish 2 w.
Gum B (10 p.). Facial rows: * 1 out., 3 persons., 1 out, from * repeat 1 time. Purl rows: knit loops on the picture. Elastic C. An odd number of loops. Facial rows: chrome., Alternately 1 person., 1 external, to finish 1 person. and chrome. Purl rows: knit loops on the picture. 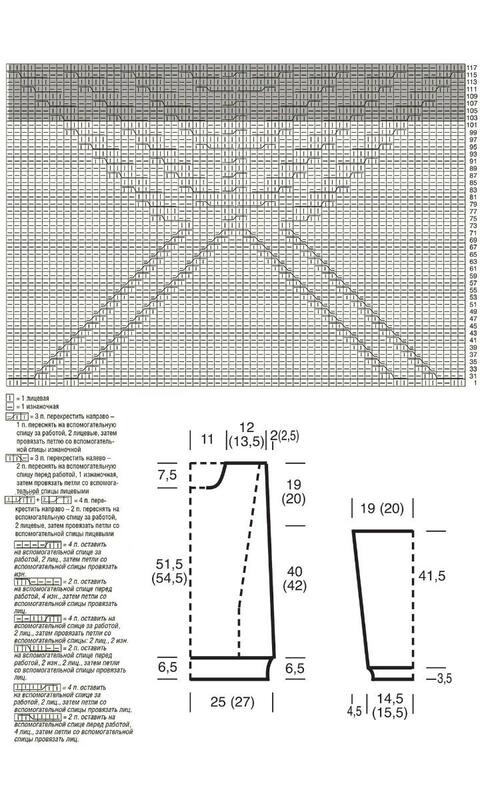 Pattern from "Crosses" (originally at 64 points). Knit according to the above scheme. On it are given only the front rows. In the purl rows of the loop knit by drawing. In the height of the 1st and 2nd p. execute 15 times (= 30 p.), then execute 1 time from the 31st to the 118th p., then repeat from the 103rd to the 118th p., while continuing to shift the loops to both sides, as originally set. "Pigtail" (4 p.). 1st, 2nd and 4th rows: persons. loops. 3rd row: 2 p. Leave on the auxiliary spoke at work, 2 persons., Then knit the loops from the auxiliary spokes with facial. Repeat from 1st to 4th row. Knitting density: 21.5 p. X 26.5 p. = 10 x 10 cm, connected by a purl and a pattern of "braids" with the spokes No. 6 (measured in the lower part); 23.5 p. X 26.5 p. = 10 x 10 cm, connected by a pattern of "pigtails" with the spokes No. 6 (measured on the shoulder fragment). Attention! As a result of the increase in crossings of the "braids" and the expansion of a fragment of the pattern of "braids", the detail narrows, in the drawing of the details of the pattern this is reflected in the form of a bevel. Back. On knitting needles №4,5, type 108 (116) sections crossed and knit a lower bar of 6.5 cm wide, spreading the pattern loops as follows: chrome, 48 (52) section gum A, 10 section gum B, 48 ( 52) g. A, chrome. Go to the spokes number 6 and continue the work with the following distribution of pattern loops: chrome., 21 (25) n. Izn. smooth surface, 64 p. patterns of "braids", 21 (25) p. izn. smooth Through 59 cm = 156 p. (62 cm = 164 p.) From the lower bar close on both sides for the humeral edges at 28 (32) p., Average 52 p. For the straight neckline temporarily leave. Before. Knit like a back, but with a round neck. To do this, through 51.5 cm = 136 p. (54.5 cm = 144 p.) From the bottom of the bar average 32 p. Temporarily leave and both sides finish separately. For rounding the neck close from the inside edge in each 2nd p. 1 time 2 points and 8 times 1 point. The remaining 28 (32) points shoulder close at the same height as on the back. The second side finish symmetrically first. Sleeves. On knitting needles №4,5, type 61 (65) paragraphs crossed and knit for a 3.5 cm strap with an elastic band C, while adding 1 point on each side of the last row = on the needles 63 (67) section. Go to the spokes No. 6 and work to continue purl stitch. At the same time, starting from the strip, add on both sides for bevels 10 times in each 10th p. 1 p. = on the spokes 83 (87) p. Through 41.5 cm = 110 p. from the strap all the loops close in the same row purl. Assembly. Run shoulder seams. On circular needles No. 4, 5, transfer the left hinges of the neck of the back and the front, between them dial on the edges of the mouth of the front on 20 p. And on all 124 p. Knit a circle in the circle: 4 pts on the front and backs on the middle , at 58 points on each side of them - with an elastic band A. With the width of the striker 7 cm, close the loop with a double thread according to the pattern, having previously knit the loops in pairs according to the pattern. Sew sleeves. Run side seams and sleeve seams. Turquoise pullover pattern from "Braids"